Darn – this is definitely one of those moments where I should have had the foresight to snip some parsley on top of this pasta before photographing! Blogger fail. Honestly, I think it was because I didn’t want to wait one more moment until digging into this cheesy smokey goodness. I was inspired to make this pasta after having some particularly delicious baba ganoush, the middle eastern eggplant dip. 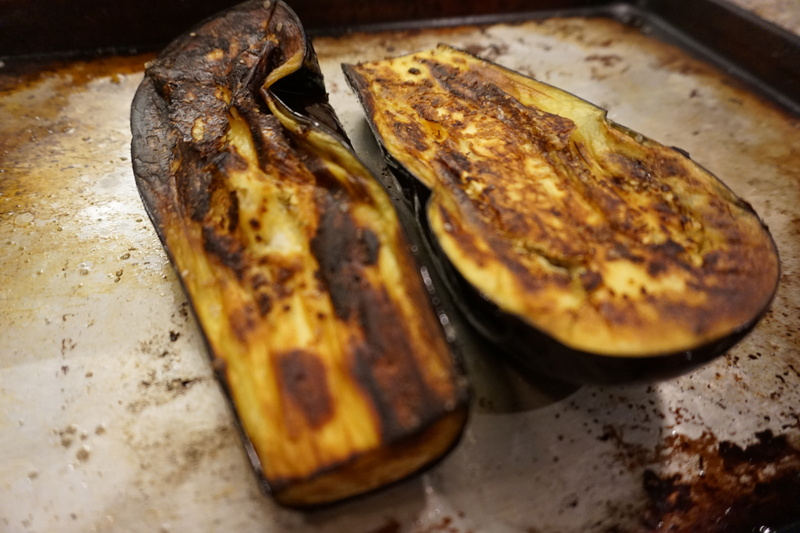 Sometimes I can find eggplant stringy or too spongy but when it’s roasted it becomes incredibly tender. Whipped up in a dip it’s delicious but it got me thinking that it could also be a lovely silky sauce. This dish comes together really quickly and if you want you could roast the eggplant in advance and keep it in the fridge for a couple of days before sauteing it with the other ingredients. 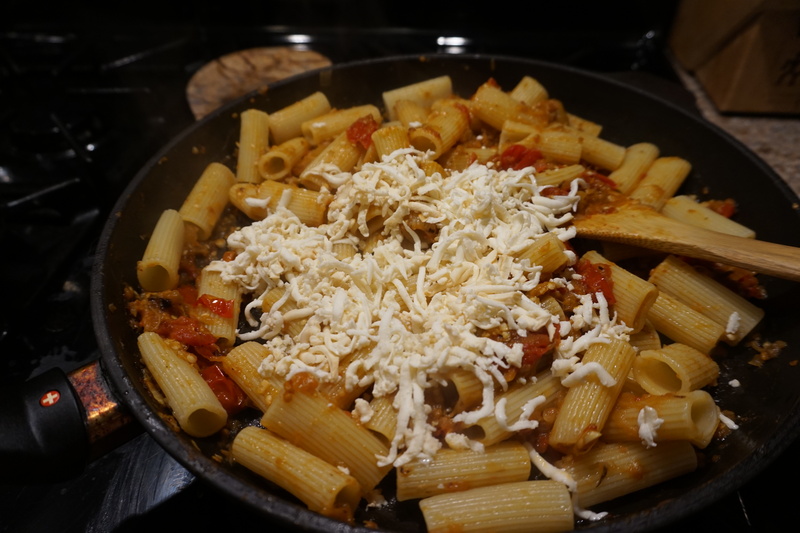 Adding smoked mozzarella to coat the pasta was a no brainer – the smoke enhances the deep flavor of the eggplant and it makes every bite nice and cheesy. A light salad on the side would be perfect with this pasta as a weeknight meal or it would make a nice first course (then you definitely want to add some green to class it up a bit) for a hearty fall Italian dinner party. Hummm, maybe a hummus inspired pasta is next! Cut both eggplants in half and rub with 1 tablespoon of the olive oil. Season with salt and pepper then place cut side down on a cookie sheet. Heat your broiler on high and broil for 10 minutes or so. Flip over and cook for another 5 minutes. Let cool until you can handle and then scrape out the now softened flesh from the inside. In a large skillet heat the rest of the olive oil over medium heat. Cook the onions and garlic for 5 minutes until softened. Add the red pepper flakes, tomatoes and eggplant and cook for 10 more minutes. Stir occasionally and use your spoon or spatula to move the tomatoes along by squishing them on the bottom of the pan. Meanwhile cook 1 pound of short cut pasta like rigatoni. Toss the pasta in the skillet with the tomato and eggplant. Sprinkle on the mozzarella and toss the pasta, adding some pasta water if needed. Serve right away. Cut both eggplants in half and rub with 1 tablespoon of the olive oil. Season with salt and pepper then place cut side down on a cookie sheet. Heat your broiler on high and broil for 10 minutes or so. Flip over and cook for another 5 minutes. Let cool until you can handle and then scrape out the now softened flesh from the inside. In a large skillet heat the rest of the olive oil over medium heat. Cook the onions and garlic for 5 minutes until softened. Add the red pepper flakes, tomatoes and eggplant and cook for 10 more minutes. Stir occasionally and use your spoon or spatula to move the tomatoes along by squishing them on the bottom of the plate. Meanwhile cook 1 pound of short cut pasta like rigatoni. 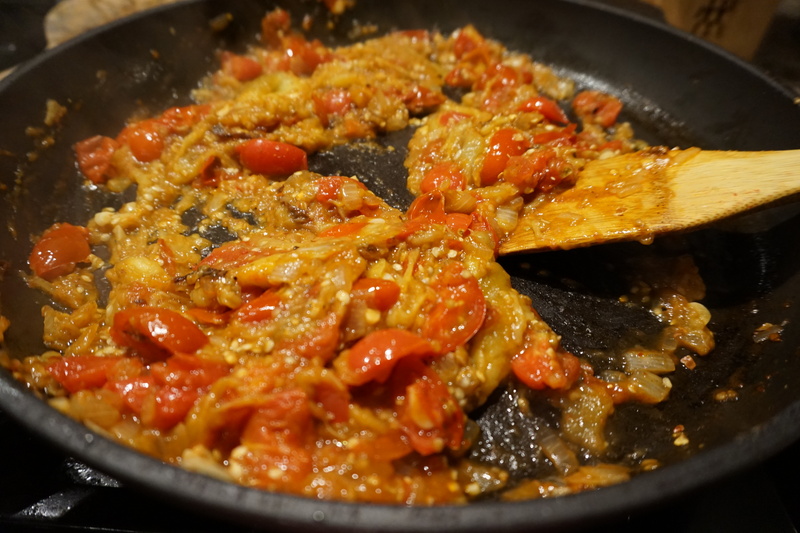 Toss the pasta in the skillet with the tomato and eggplant. Sprinkle on the mozzarella and toss the pasta, adding some pasta water if needed. Serve right away.